This undated letter is apparently a draft of correspondence from the librarian to Kate Macy Ladd after she funded the original Memorial Library. Conditions in the present library space are very crowded; adequate seating space and beautiful surroundings will mean much to the students. However, the letter also describes the current book collection as made up entirely of gifts as there has been no fund for books. The letter mentions recommended per pupil allocations, as well as a new list of books recommended for high school libraries that the librarian hopes will be listed in the Southern Highlander. 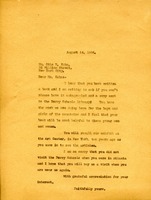 Miss Berry writes to Dr. Drury to say that it is such a pleasure to have the opportunity of knowing him. She speaks of her winter travel plans and asks him to send some of the books he's written to the Schools with his autograph. 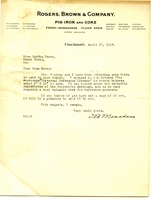 A letter from Martha Berry sent to Mrs. Herman Hagedorn thanking her for sending books and a donation from the previous year. Miss. 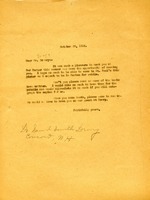 Berry also sends her apologies for not acknowledging the money donation sooner, and informs Mrs. Hagedorn that her and her husband will be missed when the New York Pilgrims visit Berry. Berry is sending the Ladds a list of books the librarian recommends adding to the library. Frances Emerson offers Martha Berry some books for the school library. 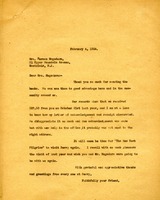 Berry asks Kahn for an autographed copy of his new book, reminding him that he attended a Berry exhibit in New York and expressing regret that he could not visit the schools during a recent trip to Atlanta. Berry is extending thanks to Chisholm, from all at Berry, for a book she sent on furniture. 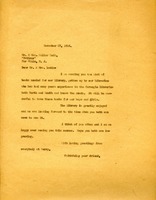 Berry's handwritten note notifies Bonner of her arrival in Maine, asks Bonner to acknowledge a gift of books sent by Julia Stephens, and directs Bonner to write her daily. 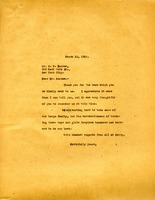 Martha Berry thanks Mr. E.W. 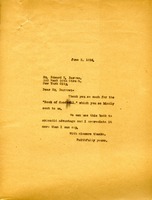 Barrow for a book he sent to Berry College. 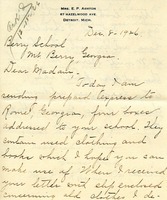 Letter to Edward E. Barrow from Martha Berry thanking him for the "Book of Goodwill" he sent to the schools. Ashton advises that she has shipped four boxes of used clothing and books. 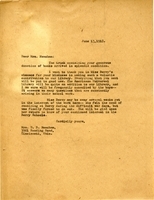 Meacham writes to Berry because he and his wife would like to send the school their copy of the Americana Universal Reference Library. Meacham asks if the school already has it, and if not, may they send the books. 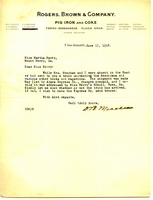 A member of The Berry Schools sends Mrs. Meacham a letter of thanks in Martha Berry's absence for the books. 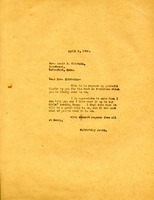 Meacham contacted Berry toinquire whether a trunk of books and magazines he and his wife sent arrived at the school.